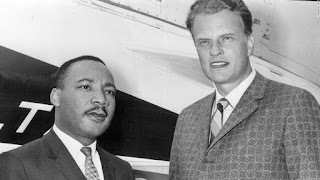 The Reverend Billy Graham died this week. I was amazed that in the 1950's he was fighting to end racism. I was also embarrassed to realize that Mr. Graham did that more than 20 years before the LDS Church ended it's racist temple and priesthood doctrines. Pretty sad for the "One True Church" to be 20 years behind in this social issue. The LDS Church did not end its Temple and Priesthood ban on "People of African" decent until 1978 and still has racist statements in all of their scriptures.